ANTI-FATIGUE - Our floor mats effectively relieve upto 40% pressure on your knees, feet and delicate joints in the legs. Whether you're standing in the kitchen for an hour cooking up your family dinner, or you're at your standing office desk working on your masterpiece, you will feel as if you're on a cloud. Less fatigue = Better Quality work! 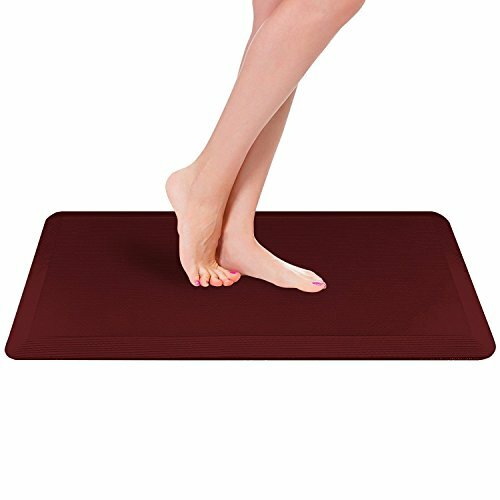 ALL-PURPOSE - Enjoy the Comfort this Mat delivers in the Kitchen, Bathroom or even your Office Workplace. Designed to be elegant in your home and sophisticated for commercial places such as Hotels, Concierge, Airlines, and Industrial facilities. SPECS - The Perfect size at 20" x 39" Inches, we offer our mats in 4 beautiful colors. Choose and match your kitchen or bathroom interior to our Jet Black, Caramel Brown, Burgundy or Beige mats. The mats are padded with a thickness of 0.75" inches for optimal support and comfort. Easily the best comfort mat one can buy at an affordable price. Try our mat risk free now and you will soon realize what a valuable investment you've made.